TriMet’s 2014 Attitude & Awareness survey shows strong gains in favor of the agency’s performance. The results were released today at the Board of Directors meeting in Beaverton. DHM Research conducted the telephone survey in mid-November, which tracks the agency’s performance, services, new projects and ridership. Approval of TriMet remained high and was up across the board. DHM Research said the increases are likely due in part to recent service improvements and restoration, focus on improving reliability, infrastructure investments and the resolution of the labor contract. TriMet’s overall job approval rating was 76 percent, an increase from both 2013 (66%) and 2010 (71%). Bus approval was 78 percent, an increase of 13 points compared to 2013 (65%) and in line with 2010 (74%). MAX approval was 84 percent, higher than both 2013 (69%) and 2010 (79%). Perception that the bus and MAX systems were operated safely continued to climb. Respondents said that buses were operated safely (76 percent in 2014 compared to 67 percent in 2013) and MAX (79 percent in 2014 compared to 68 percent in 2013). 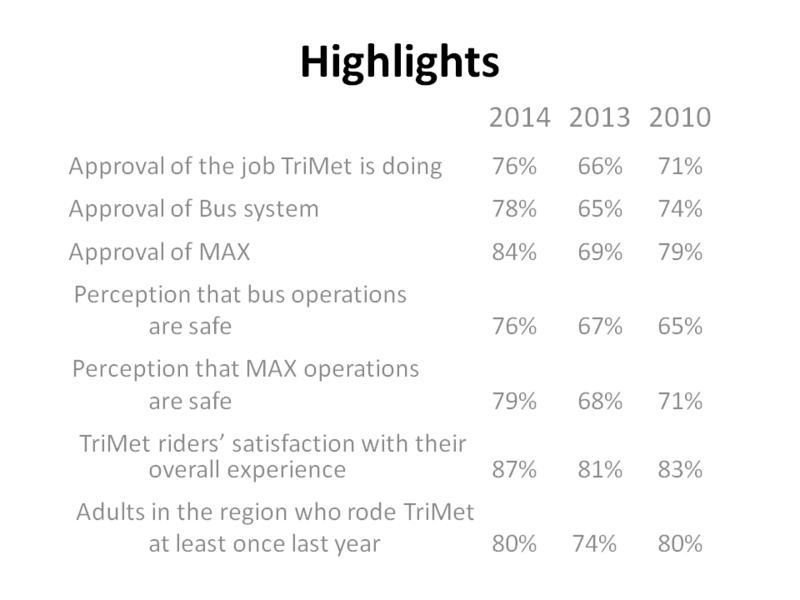 Riders gave higher overall satisfaction ratings – 87 percent in 2014 – than in 2013 (at 83%) on the benefits that TriMet provides to the region. And most non-riders said they value the benefits TriMet provides to the region (84%). Frequent and regular riders used TriMet most often to commute to work and school. These riders were satisfied with the value of the cost to ride, with 75 percent saying the fare value was excellent or good. Occasional and infrequent riders used TriMet most often to get to recreational activities followed by personal business. These riders rate the value of the cost to ride at 65 percent excellent or good. Awareness of the Portland-Milwaukie Light Rail Transit Project – the future MAX Orange Line – was high at 80 percent in 2014 compared to 78 percent in 2013. Respondents said the main benefits of the new line included reducing traffic congestion, connecting parts of the city and expanding public transportation. Awareness of the Tilikum Crossing, Bridge of the People was also high at 78 percent. Respondents noted the main benefits of the new bridge were reducing traffic congestion, the addition of a pedestrian bridge and ease of access. View more of the 2014 TriMet Attitude & Awareness Study findings. The telephone survey of 1,000 residents, ages 16+, throughout the tri-county area was conducted in mid-November, with a margin of error +/- 3.1 percent at the 95 percent confidence level. Quotas for age and gender in each county were used for a representative sample.